Toray Industries is widely recognized as the world leader in carbon fibers, but few people outside of the auto or aerospace industries knows its name. 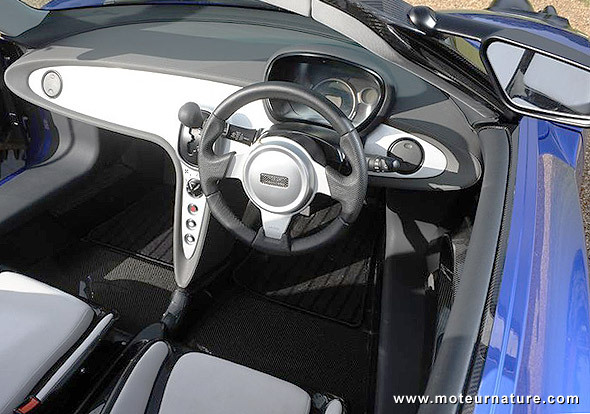 To change that, the Japanese company hired world-famous engineer Gordon Murray to build a one-off sports car to showcase the huge weight advantage of carbon fiber materials. They chose to do an emission free roadster, which leads to the choice of an electric propulsion system. That came from Mitsubishi. This roadster goes by the name of Teewave AR.1 and it has the same power train as a Mitsubishi i-MiEV. Despite its larger size, it’s a lighter car. This roadster is 157 inches and 70 inches wide. With a carbon monocoque, the Teewave AR.1 weighs only 1874 pounds. This is amazing because that’s with the 529 pounds battery included! Of course, the car meets all safety regulations, with a crash structure entirely made of carbon at the front. Acceleration 0 to 62-mph requires 11.4 seconds, and range is 115 miles. Much better numbers that the small Mitsubishi can achieve, yet the most important feature of the car lies elsewhere. It’s in the carbon material itself. The Toray carbon fiber component system has a process time of less than 10 minutes. Nobody does it better.